"I like to dress like I'm playing a character. This is a little bit like my Italian going grocery shopping character." I hereby bestow her with the honorary title: "Contessa of the Valencia Corridor". Love the mix of luxe fabrics: silk, wool jersey with cotton and straw(?). I also admire the fact that she has confidence in spades, especially since this was a cold day that included rain 30 minutes after I ran into her. 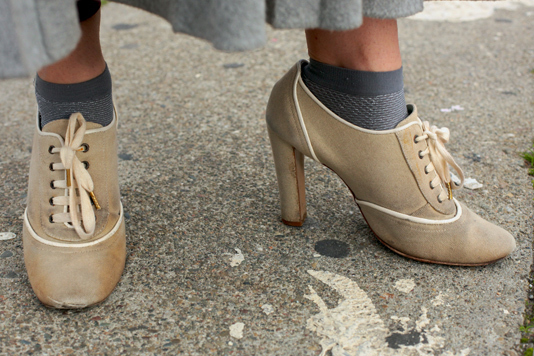 Fabric heeled oxfords in taupe. I really like the long skirt.